What is a Good Room? Think you know the rules of Freeburn? Test out your knowledge with The Referee's quick and simple quiz (answers below). Here is what we have all been waiting for, this is a link to Qore's March episode on You Tube, this is the first link I found and you do have to wait through the loading at the beginning, but after that is all the Island footage for you and a peak inside Criterion Games offices in Guildford, UK. 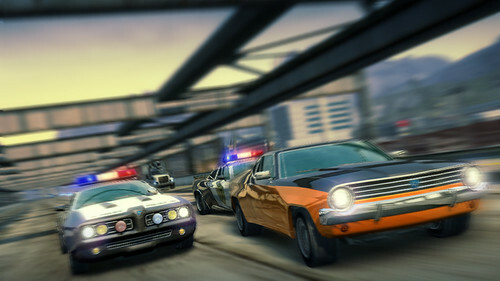 Criterion Games have released a few pictures of the future DLC which they are calling "Cops and Robbers Pack". Criterion Games say this will bring the thrills and spills of cops and robbers car chases to Paradise City. Criterion Games have release full details of how Burnout Paradise is changing with the update released on the 6th of February. Criterion Games have today announced that restarts are coming to consoles in a FREE update on the 5th of February. Read more about U-Turn on Re-Starts! 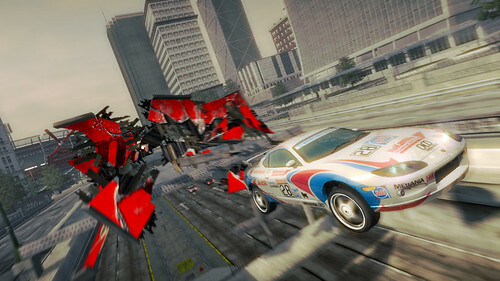 Criterion Games have released a range of Burnout Paradise merchandise. Ranging from mugs to t-shirts, posters to bumper stickers, even an apron! The complete Legendary Cars pack has now been revealed over at CriterionGames.com. In the first full Crash TV episode of 2009 there is more footage of the Jensen 88 Special and a first look at the other 3 cars in the Legendary pack. The cars are going to be available both online and offline and have more under the hood then their un-legendary counterparts. They each have special features when you press L3 on the controller. Today BurnoutAholics hosted the first weekly Wednesday Burnout 3: Takedown event. Every Wednesday from about 7pm GMT we will be hosting a BurnoutAholics room on Burnout 3: Takedown. This room will be a variety of racing and road rage with a variety of different series locks. We might even throw in some crash junctions! Please look out for us on Wednesdays, if the room is full, please send us a message, or just host your own room! Hopefully we will be able to get enough people playing to get a few rooms going!